What did I do with my weekend? Oh, nothing much. We flew to Galway for Sunday lunch. It started about five years ago when I had a conversation with a colleague on the way to a meeting in Leamington Spa. He was a pilot, I learned, and he liked to take people up with him so that he could split the cost, keep his flight hours up and get a nice day out. He's left the company since, but every time I see him, I ask him if he's still flying. He's been asking me for some time if C. and I fancied a trip, and eventually - when I bumped into him at a retirement bash - we made a plan. So, we left Tollerton airport in Nottingham around 9am on Sunday morning (seeing a couple of hares as we taxied along the runway), flew over Nottingham and past Stoke and Crewe, past Manchester and Liverpool on our left hand side, down the Menai Strait, around Anglesey and across the Irish Sea, past Dublin on our right and on across Ireland to the west coast. The weather was pretty good, and as I was sitting in the co-pilot's seat, I had a grandstand view of the flight, pausing occasionally to help the pilot with the maps and the transponder. Wearing headphones, you get to hear all of the chatter with air traffic control and other flights in the area as you make your way from one zone to another. Each air traffic controller was calm, efficient and really helpful as they moved planes across their zones and handed each one on to the next ATC area. I've never really had a chance to listen to chatter like this, and it was fascinating. Obviously, small airports like Tollerton have a pretty small zone and very few aircraft to deal with, but larger airports like Manchester, Shannon and Dublin are dealing with major transatlantic flights and we got to hear them talking to KLM, British Airways, Scandinavian Air and Ryanair as well as the many smaller aircraft. East Midlands in particular seemed particularly perky, both ways. Perhaps it's the house style? I also got to watch the pilot flying the plane at really close quarters... all the while desperately trying to keep my long legs out of the way of the pedals and the controls that were right in front of me and were fully operational. On the return flight, I sat in the back. It's funny how green England looks from the air. There are lots of towns, of course, but you really get to see the shape of the land, and the way that the gradient sharply changes as you get into Derbyshire and how the Mersey Estuary opens up on your left, with lots of windfarms just offshore and the Welsh Mountains rising steeply over on your left hand side. The original plan had been to fly over the mountains, but they were cloud covered on the way out and so we routed around them. The sun was out on the way back though, so we flew by Snowdon. Britain looks magnificent from about 2-3000ft up. Ireland is beautiful too: noticeably fewer towns and lots of green fields, broken up by fields of peat. Sitting on a normal passenger flight, you're pretty remote from the process of flying, but here you have a grandstand view. You might think that being in such a small plane as this makes the whole thing seem more precarious, but actually it really doesn't. I don't much like landing in a normal plane, but here, watching how our pilot slowed the plane down and gently plopped it down, you could really feel how in control he was, even in a crosswind. Galway itself has a lovely little airport. Apparently it once serviced around 16 flights per day all across Europe, but now all those airlines are bust, and we looked like we might well have been the only traffic they saw all day. We spent about three and a half hours in Galway, in total. It seems a busy little town. Nothing too much to look at, but a bustling high street filled with buskers and restaurants and bars. If you walk down a little bit, there's a nice stroll out towards the sea. We had lunch and a walk and then headed back to the airport for the return trip. With the wind now behind us, the return journey only took two-and-a-half hours, a good hour faster than the trip out. It was now pretty sunny and we had a great view all the way home. Not a bad way to spend the day. 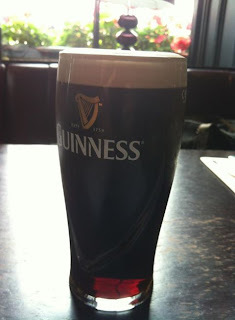 After all, it's not every Sunday where I can say that I had a properly poured pint of Guinness with my lunch, is it?